5.3L Engine rebuild help in NC? I have 2000 Silverado, ext. cab, 4x4, auto trans, with the 5.3L engine and 230k miles on it. Nearly rust free body! The engine has been leaking oil and smoking for a while now, and I'm concerned that it might be getting close to time for a rebuild! I want and need this truck to be reliable! I also need to start preparing myself financially and find a quality, Chevy engine mechanic to do the job! First, can anyone give me a rough estimate on a complete rebuild and labor costs? 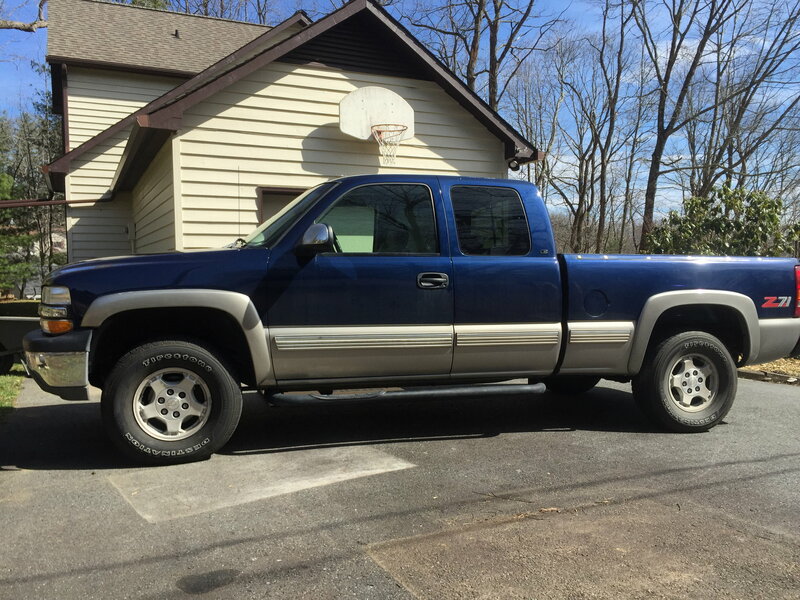 Second, I live in Boone, NC., but would be happy to take the truck anywhere in the southeastern region to have the work done by someone that is an honest, fair, and has experience working on Chevy engine's, and that does quality work! Anybody know of such a place or person to have the engine rebuilt? Lastly, Should I even rebuild the engine, or is there another alternative? Thanks so much for all your time and help! That engine should last longer than that! I say just replace the gaskets or whatever else it needs to stop leaking. Nice looking pickup. I have the same wheels yours does, but MMJ is correct. Maybe you can hire a professional tech to give it a good look before you decide to rebuild? Thanks for the responses! I am going to take it to a professional mechanic soon to have them check it out. I wiped off all the oil on the engine last night, so that I/we can see where the oil is leaking. I also wanted to replace the PVC valve, but I think it might be built into the valve cover, is that correct? I definitely noticed oil leaking from the front of the motor, behind where the belts are, it looks like a gasket from something, could that be the water pump? I also think it may head gasket leak. Here's another question! Say the smoke is a sign of worn rings which causing lower compression right? Well, if I have to pull things apart to stop oil leaks, what else should I be replacing for the longer haul while I/we are in there that deep? I'd rather replace things now, than have to pay for labor twice! No, a water pump can leak water but not oil. It could be the front main seal. But is it really bad? If it's just a sweat then I wouldn't sweat it hehe. If it drips I would worry. That's what I thought, thanks for clearing that up though! It must be the front main seal then! That makes more sense and looks about right. It has left quite a mess, but now that I cleaned up the mess, I'll see really how bad it is. Thanks again! M-T: my guess is that the smoke you are seeing usually comes from two main places. Worn out cylinders, pistons, and rings, and/or worn out valve guides/valve seals. In either case, the smoke is going to plug up your EGR valve, burn-out your catalytic converter. and will generally make things worse over time. Trust me, I don't like giving you this bad news but I know my engines. The good news; well not that good to be sure, but cheaper, as it's not as likely, is that it's solely a valve issue, but it MIGHT be, in which case a pair of rebuilt heads would solve your problems. But the fact remains that it's not as likely as worn out cylinders since valve leaks usually clear up to a great extent when the engine has been driven a few miles and is warmed up. Constant smoking is usually the sign of worn out cylinder parts (rings, pistons and the cylinder bores). The cylinder pressure tests the mechanic will do should prove that out, one way or another. Trust me, it's not fun telling you the truth about this, but a very good rebuild will save your catalytic converter from destruction and the EGR valve can be replaced when the top-end is done, which is not near as expensive as a complete tear down and overhaul, nor buying a newly rebuilt engine would be. one in. Easy as pie, so that is some good news. If the seal is hard, it's easy to pry out of the valve cover and replace it too. Last edited by oilcanhenry; April 13th, 2019 at 11:23 AM. OilcanHenry, Thank you for the reply and info.! I really appreciate the truth! I want to get to the bottom of this diagnosis/problems and move forward! I want to get this truck back in good condition and strong! I think you are absolutely correct, but again I don't know who or where to turn to, to get the work done!? I love doing my own work (if and when I can), but I can't rebuild the top end on this engine. I also don't know who or where to trust as far as getting the best parts, and new or rebuilt heads? Does having oil sludge change how I should handle this engine? I don't hear any knocking, just the classic valve clicking/chatter when starting. I just wish I/we could trust people more these days! Seems like the quality of just about everything has gone down, and I just don't want to get into paying for parts and labor that isn't going to last. Thanks again for all your time and help! Ask friends/family/coworkers and other people that you trust where they take their cars. Those are usually the best endorsements. Number of and location of Equinox blend doors? ?